Arts of the Islamic world cover artefacts from countries in North Africa, Turkey, the Middle East and the Indian sub-Continent. These works take a variety of forms. They include manuscripts with fine calligraphy; early medieval pottery such as Kashan ware, colourful glazed Isnik pieces or decorative tiles from Safavid dynasty in Iran; metalwares like bronzes from Mamluk Egypt or Timurid Persia; astrolabes which pre-date most of their Western counterparts; and early Silk Road textiles such as Sogdian weavings. Our weekly selection from salerooms and dealerships. A newly discovered Ottoman charger described as one of the most important pieces of Iznik pottery remaining in private hands was the toast of Islamic Week, selling at Sotheby’s for a spectacular £4.55m (£5.4m including buyer’s premium). The Debbane charger, a newly-discovered 15th century Iznik dish, was the toast of Sotheby’s Islamic Week offering, selling for a spectacular £4.55m (£5.4m including buyer’s premium). A newly discovered Ottoman charger, described as one of the most important pieces of Iznik pottery in private hands, will be offered at Sotheby’s Arts of the Islamic World sale this week. The biannual series of Islamic and Indian art auctions held in April and October offers a wide range of art and artefacts celebrating the rich and diverse cultural heritage of the Middle East and the subcontinent. This year’s ‘Islamic Week’, running from October 22-26, includes sales from five auction houses, highlights of which are pictured below. Tributes have been paid to Islamic art’s ‘most influential’ dealer Oliver Hoare who has died aged 73 after a battle with cancer. Oliver Hoare, the leading Islamic and Asian art dealer, has died aged 73 after a battle with cancer. Church Street traders have two reasons to celebrate after the successful launch of Middle Eastern-focused AlFayez in Alfies Antique Market and the second edition of its Sunday street market event 'Antiques Anonymous'. 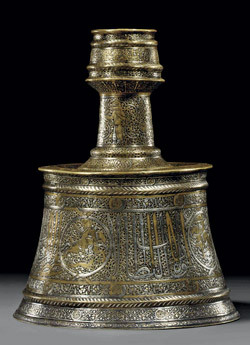 A long-running legal dispute over a Fatimid rock crystal ewer that had been due to sell at Sotheby’s has been settled in court. Two finely executed Indian talismanic shirts made multi-estimate sums at Roseberys in south London. Multi-estimate sums proved the norm among the star lots during London’s Islamic Week auction series. An important glazed Islamic calligraphic tile stolen in Uzbekistan is to be returned to the country after it was discovered for sale in a London gallery. Francesca Leoni, the Yousef Jameel Curator of Islamic Art at the Ashmolean Museum, will be the headlining speaker at the 2016 LAPADA Art and Antiques Fair taking place from September 13-18 in Berkeley Square, London. Export bars have been placed on the robes and dagger of TE Lawrence (1888-1935), better known as Lawrence of Arabia, in a bid to keep the items in the UK. The highlight of Bonhams’ latest sale of Islamic and Indian art in London was this rare Gujarati mother-of-pearl artwork of early date and exceptional size. Among the highlights of the current Wilkes & Curtis auction is a Fatimid gold dinar from the reign of the Caliph al-Hakim (AD996-1021). A key component of this spring’s series of Islamic auctions was Bonhams’ 30-lot consignment of objects relating to Tipu Sultan, the Tiger of Mysore. Annual auction totals hold steady across provincial salerooms. One of the highlights of the latest raft of Islamic auctions in London was an unusual half-moon-shaped 10th/11th century granite temple step from Sri Lanka which had spent years in a Devon garden. Two of the greatest offerings of Islamic coins ever have recently been sold in London. The two catalogues – Morton & Eden’s and Baldwin’s – will be useful historical documents for a long time to come.